After a few good months of deals for Canadians the with Air France KLM's Promo Awards we see a slow down for the upcoming busy summer travel season. These award ticket deals are bookable as of tomorrow (April 1) and are good for award travel for June and July of 2015. 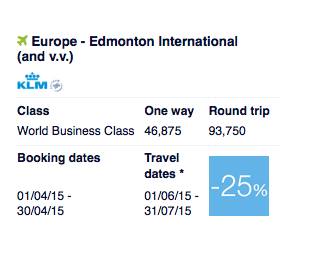 The offer this time is only for 25% off Business Class on KLM's new route out of Edmonton to anywhere in Europe! This is an OK deal for those in Alberta however keep an eye out on schedules as the Edmonton flight was already postponed from May 8th to the 19th due to labour relation issues and it could be pushed back further. Don't fret however, if you do redeem KLM has to get you to Europe in Business Class so if the schedule does change they will more than likely throw you onto WestJet to Calgary or Vancouver to hop on the KLM flights out of those cities. Don't have the miles? You could always consider transferring Starpoints earned via the Starwood Preferred Guest Credit Card from American Express to Flying Blue. The card has a 20,000 Starpoint bonus right now which translates to 25,000 Flying Blue miles, which gets you close to at least one way in biz class between Edmonton and Europe! What are the promo awards? The promo awards are a discount of 25-50% off the regular Flying Blue mileage requirement for select Air France, KLM, Air Europa and Kenya Airways award tickets in select cabins. To take advantage of this deal you must book your promo award ticket between Apr 1 and 40 for travel between June 1st and July 31st, 2015. More details can be found here.